Unique gift for the hockey player, the whole team or the coach - a personalized Hockey magazine cover. Features your photo and customized headlines all about the season, stats and special memories. Customize as an Ice Hockey gift or a Field Hockey gift! Searching for a unique hockey gift? 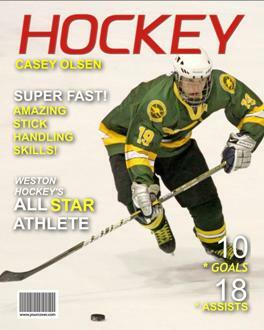 The YourCover “Hockey” personalized magazine cover template puts your favorite hockey player front and center as the star of their very own fake magazine cover. Whether you need a unique hockey gift for a birthday or to celebrate a successful season, this special keepsake is sure to be a big hit. Use the YourCover magazine cover generator to customize headlines to be all about your favorite hockey player. The magazine cover can be used to create a unique Ice Hockey gift or a Field Hockey gift, simply customize the text to reflect whichever sport you are celebrating. Upload a photo of your friend or family member in his /her uniform or playing hockey, then choose from our wide variety of headlines and revise them so that they reflect your hockey-lover’s likes, dislikes, and special season memories. When completed, your personalized magazine cover will be a gift as unique as the hockey player whose photo is on the front cover. Utitilze the inset photo feature to add a second photo to the front cover. Perfect for adding a team photo or a photo of the hockey player when they first started out in the sport. Our one-of-a-kind back cover feature allows you to add a special message to your personalized hockey gift, as well as additional photos. If you need a last minute gift, you can choose a downloadable photo file to print yourself, or let us print and frame your unique hockey gift for you. Gift service and rush shipping are also available as well as a variety of frames, mugs, posters, and other accessories. When searching for a unique gift for a hockey player, create and personalize a fake magazine cover for a gift that will be kept for years to come.